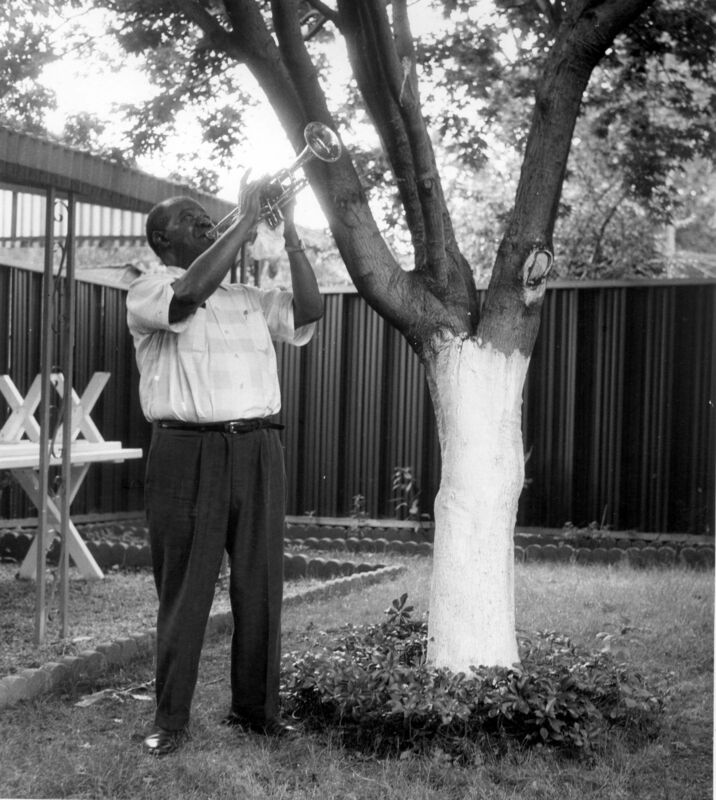 After marrying his fourth wife, Lucille Wilson, in 1942, trumpeter Louis Armstrong was ready to settle down. Now the modest house on 107th street in the Corona section of Queens where he and Lucille resided is a National Historic Landmark. 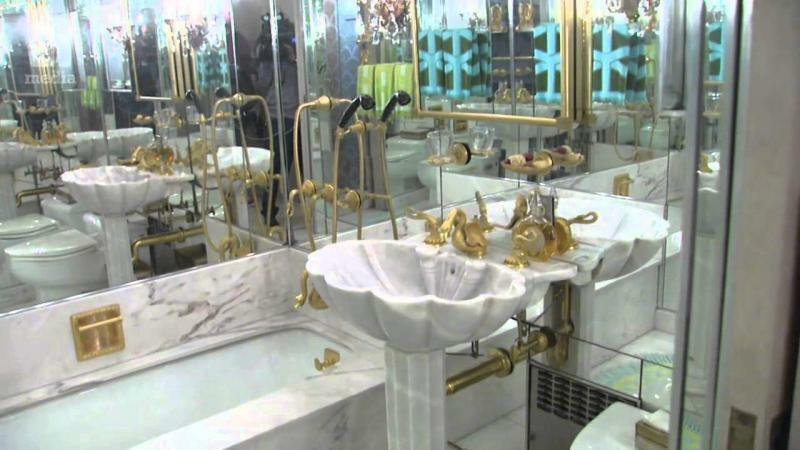 Fulfilling Lucille’s long-held dream that the home become a shrine to her late husband, it opened to the public as the Louis Armstrong House Museum on Oct. 15, 2003. Armstrong lived in this 11-room house for nearly three decades and died there in his sleep on July 6, 1971. Twenty-nine years earlier, having wooed and wed Lucille, Armstrong decided to put down roots in that decidedly working-class neighborhood. The world’s premiere American jazzman, Armstrong first played music while at the Colored Waif’s Home for Boys in his native New Orleans, became a star in Chicago in the mid-1920s, made major appearances and recordings on both coasts and toured Europe in 1931 partly to avoid the Chicago gangsters who controlled most of the Windy City’s entertainment industry. Finally, he hired a new manager, Joe Glaser, a mob-connected wheeler-dealer who straightened out his legal entanglements, his gangster worries and his debts. Armstrong endured problems with his fingers and lips aggravated by his unorthodox horn-playing-style. So he branched out, developing his vocal style and making his first theatrical appearances and several movies. In 1937, he substituted for Rudy Vallee on NBC radio and became the first African-American to host a sponsored, national broadcast. Although he was 13 years older than her, the couple was married that October 1942 in St. Louis, Mo., at the home of vocalist Velma Middleton. 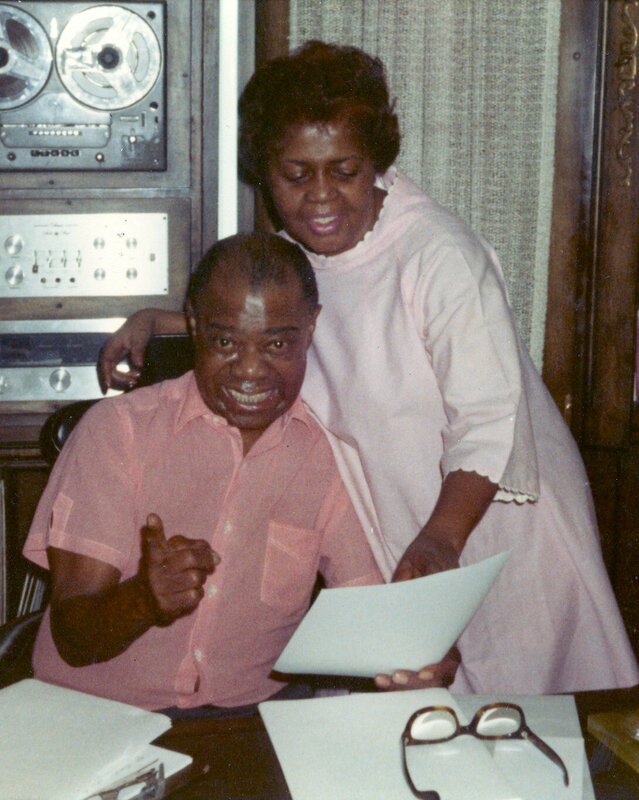 According to Pops biographer Terry Teachout, Lucille gave up her dancing career and devoted her life to being Mrs. Louis Armstrong. Knowing that he’d finally found his soulmate, Armstrong determined to do something many musicians never do—enjoy a comfortable and orderly home life with his newfound bride. While Louis finished up a tour in March 1943, Lucille went house-shopping, and she found a distinctive looking clapboard home built in 1910 in Corona, Queens, N.Y. Its price was $8,000. She put a down payment drawn from her savings and moved in. Louis saw the house for the first time at the conclusion of a tour. “It was in the wee hours of the morning and I was real beat,” he later recalled. “I get up the courage to get out of the Cab and Ring the Bell. And sure enough the door opened and who stood in the doorway with a real thin silk night gown—hair in curlers. To me she looked just like my favorite flower, a Red Rose. The more Lucille showed me around the house the more thrilled I got…I felt very grand over it all.” After three failed marriages and years of wandering, noted biographer Terry Teachout, Armstrong had found a home that he loved and a wife whom he trusted. The Japanese-style garden in the backyard was the scene of Pops’ last birthday party on July 4, 1971, a couple days before he died in the house. 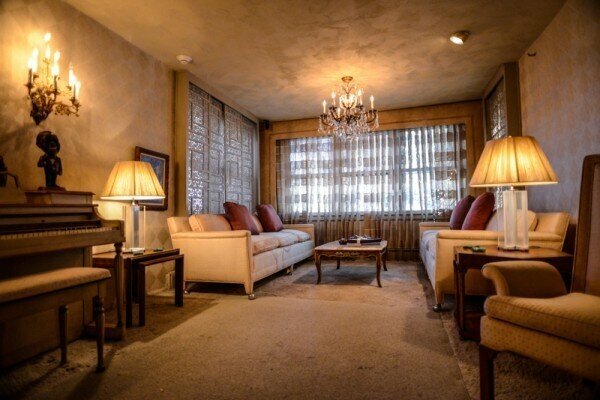 After negotiating a notably narrow stairway, visitors pass quietly by the master bedroom with its peach-colored king-size coverlet and sparking chandelier and mosey into the walk-in closet where Lucille’s dressing gowns still hang. After Armstrong passed on, Lucille lived there until her death in 1983. Visitors marvel at the upstairs office den where Pops wrote parts of his second biography and where Armstrong-the-archivist operated two Tandberg reel-to-reel tape decks and stored more than 650 tapes, mostly his own spoken reminiscences, each box cleverly illustrated with a colorful collage. Throughout the house, speakers play fascinating bits from Armstrong’s reels. Along the way, guests pass by a lovely white upright piano, and musical instrument geeks can make an appointment to gaze upon five trumpets, 14 mouthpieces, 86 scrapbooks, letters and manuscripts and 120 plaques. A gift shop offers books, recordings and photographs and other mementos, including boxes of Swiss Kriss. Since opening its doors 13 years ago, the Louis Armstrong House Museum has welcomed more than 100,000 people to the humble home. The museum holds 10 collections of photographs, sound recordings, letters, manuscripts, instruments and artifacts, making it the world’s largest publicly held archival collection devoted to a jazz musician. A new visitor’s center soon to be located across 107th Street, will make even more archives available to students, researchers and jazz fans. 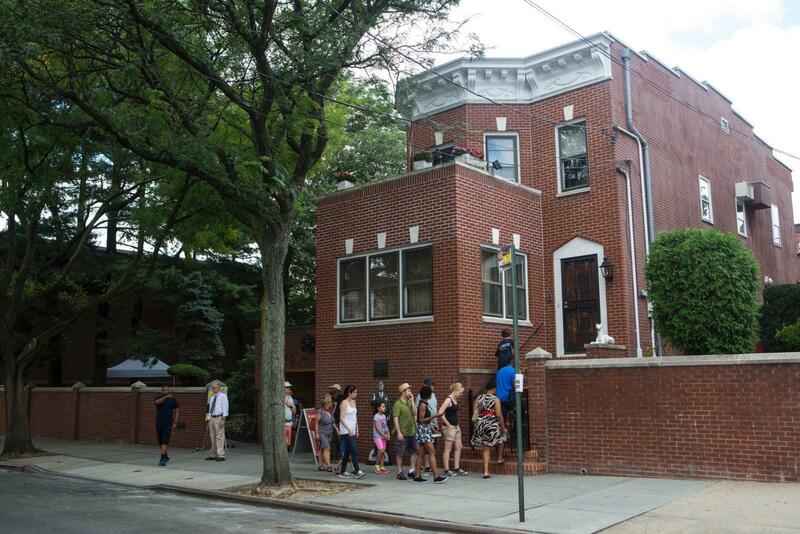 Major funding for the Louis Armstrong House Museum is provided by the Louis Armstrong Educational Foundation, and additional funding comes from Queens College, the Institute of Museum and Library Services; Bloomberg LP; and the New York State Council on the Arts. The historic site is owned by the New York City Department of Cultural Affairs and administered by Queens College under a long-term license agreement; louisarmstronghouse.org; (718) 478-8274. Tours of the museum cost $6, and school tours designed for students in grades K-12 meet the New York State and New York City Learning Standards. A few of the museum’s docents are musicians Ed Polcer and Bria Skonberg, who can bring Armstrong’s music to life on their horns. Tuba player David Ostwald, bandleader of the Louis Armstrong Eternity Band (a.k.a. Gully Low Jazz Band), shares trustee duties with critic Stanley Crouch, and musicians George Wein, Jimmy Heath and Wynton Marsalis serve on the advisory board. 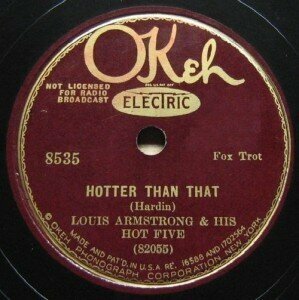 Current Exhibit: Hotter Than That – 90 Years of Louis Armstrong and His Hot Five. This new exhibit celebrates the landmark recordings that were the first records ever to be issued under Armstrong’s own name. The exhibit represents the ground-breaking recorded legacy of Louis Armstrong and this immortal group which included pianist Lil Hardin, trombonist Kid Ory, clarinetist Johnny Dodds, and banjo player and guitarist Johnny St. Cyr. Russ Tarby is based in Syracuse NY and writes about jazz for The Syncopated Times, The Syracuse New Times, The Jazz Appreciation Society of Syracuse (JASS) JazzFax Newsletter, and several other publications. Next How’s Your Festival Doing?